Powder rooms are one of my favourite rooms to design and decorate. I love them because they are small and easy to make fabulous. They cost much less than a regular bathroom to renovate because there’s generally only a basin and loo, so you can get more bang for your buck spending your money on fabulous decorative features. You can also afford to be bold and adventurous with your decorating style because it’s a space that you are only in fleetingly. I think it’s the perfect room to express yourself and have fun. The powder is in the downstairs hallway between the entry foyer and the kitchen. It has no windows and is only 1.8m wide. As with most other rooms in this house when we moved in, it had a rather dreary dated English country house look with beige and red wallpaper and ragged painted timber vanity, with brass fixtures and beige tiles. All perfectly fashionable and no doubt on-trend for a design done 25 years ago for an older couple, but in desperate need of an update for our young family. I much prefer crisp white woodwork and trim, rather than cream. The American Federal style mirror had potential but I ended up selling it on Ebay. I thought about repainting the vanity, but for the money it would cost to replace the bench top and have it repainted, it was a much cheaper option repeating the pedestal basin I used in our Sydney house, which I loved. I knew I wanted to use the Schumacher wallpaper, which again I had dreamt of using for some years. I am also mad for paneling of any sort in a powder room or bathroom, and this was the perfect place. It also means you use less wallpaper. I added wainscoting to most of the walls in the downstairs entry and living rooms, so it made sense to continue it in here. The walls were patched and prepared, although part of the floor had to be replaced because we had to relocate some of the plumbing. Luckily there’s plenty of space beneath the house for trades to get access, so it’s not too tricky to rework these things in our house. The paneling is simply MDF profile and I drew the pattern on the walls, then added painters tape and worked it out with the carpenter as we went. It’s a relatively quick and simple way of adding architectural detail to a space, and the materials are pretty inexpensive, so it’s more the labour that’s the main cost. I toyed with a million different tile options, and even imported a selection of beautiful marble mosaic samples in the most stunning patterns and colours from China. But got cold feet in the end and left my run too late to have time to get them here. I also would have had to order a pallet from China, and didn’t know if I wanted the same thing everywhere. In the end I opted for a simple honed marble hexagon tile which I found online from a Brisbane tile shop. I used the same one in the girls’ shower, which made sense for cost efficiency. I thought about having a tiled border around the edge, but as much as I love the look the cost of doing it was prohibitive for this room and I was pressed for time. It’s very labour intensive, and labour costs money. 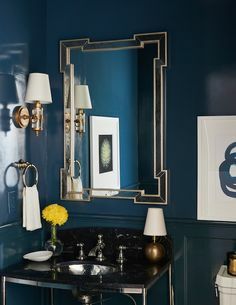 I just adore this wallpaper and seeing it without the mirror and lights installed, I think you actually appreciate the beautiful design more. I’d love to use it in a bigger room. Our last powder room you may recall was also blue and white, very similar but using a gorgeous Thibaut wallpaper. So to make it a bit different I opted for the same black mirror but with oil-rubbed bronze tapware and accessories which I think add great impact and contrast. I wish I’d used them in more rooms now. They were hard to come by though, as there aren’t a lot available in Australia and at an affordable price. The gold ceiling light you see reflected in the mirror I bought online from the US. It’s by Suzanne Kasler and picks up the gold in the starburst mirror. The pedestal basin is the same one I used in our last house as well. It’s so well priced, and I think looks fabulous. It’s just as good as any you would get from an expensive designer bathroom shop, and looks almost identical to the many I have seen in gorgeous American bathrooms. I like having a pedestal basin in a small powder room as it makes the room feel more open and spacious than a solid vanity would. I like that the basin has plenty of room around it for candles, flowers, soap, towel and a ladies’ handbag, for visitors. Nothing worse than having no place to rest your bag in a guest loo when you touch up your lippie I think. The beautiful gold starburst mirror I found in a little antique shop in Palm Springs when we visited there 18 months ago. 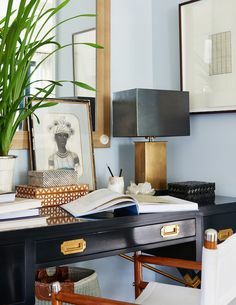 I love gold accents with blue and white. Makes a nice change to silver. Remember you can use your blue and white jars and pots as vases. They look lovely, hide the stems and add something extra to the room that glass can’t. Instead of leaving them on the shelf, put them to work! The trick with the wainscoting in this room was making it high enough so that it sat above the spout and you could get your hand around taps to turn them. The vintage glass candle bowls are also a pretty addition. I found the striped blue and white ceramic waste paper bin at Pottery Barn Kids in Australia. I use the timber trug for loo rolls. The bathroom wall sconces and all the bathroom accessories, except the taps, I found from Pottery Barn US. They do a beautiful finish in black or oil rubbed bronze. The lights weren’t converted, but installed as is. I added the blue ribbon to the lampshade. The bathroom looks nice at night too, but has a much warmer glow. The lampshades although they look white have a cream linen on them which is much more apparent when the lights are on, and the gold ceiling light adds to that as well. The black mirror was something I found by accident at Early Settler some years ago. It was a tarnished gold, but I painted it gloss black. Hope you have found this post inspiring and helpful. Remember be a bit bold with the decorating in your powder room. It’s the one place you can afford to be a little adventurous and express your creativity and decorating talents. Simply stunning….. & inspiring! My loo has “beige” floor tiles which must go when the tiling gets done! Thanks Jane. Our ensuite unfortunately is beige travertine from wall to wall, and not something I could afford to redo at the time when we renovated, but it irks me and I much prefer whites and greys, so have it on the list to do for the next phase! Mel, my bathroom tiles were beige & federation green! As a temporary “solution” I had them Thermoglazed in white. I had the green floor tiles done too – however, there are a few chips appearing due to wear & tear, but not too noticeable. (Floor guarantee is 5 years & the wall tiles 10 years). Not sure you can Thermoglaze travertine. I am so looking forward to renovating! Your blog on both your beautiful homes keeps me inspired. Thank you. It looks gorgeous, I especially love the wallpaper design it is beautiful. I would love to use this paper in my entrance hall, it is an older brick bagged cottage that I have decorated Hamptons style, but do you think it might not be a suitable design for an entrance hall, more reserved for powder room/bedrooms? We have just had a brand new beach house built and I also used hexaganol cararra marble on the shower base although I wish I hadn’t gone with black floor tiles that do come up and cover the lip of the shower. Here is a link to the project, would love your opinon? It is a new build that I had some input in which included the barn door and colour scheme. I think that wallpaper would be fabulous for an entrance hallway, again because you don’t spend a lot of time in there, it’s a passage. It would look great in a dining room too. The beach house is absolutely stunning, just adore every detail. Wish I could buy it, and the barn door is spectacular. Thanks for sharing it with me, I love looking at other people’s fabulous new American inspired builds. I think the bathroom tiles are fine. Thank you so much for responding Melinda, I am going to see if I can track down that paper in Auckland, I am glad you felt it would be ok in an entrance way and I agree it would look nice in a dining room too. Yes the beach house is fabulous, but bitter sweet for us as I want to get the mortgage paid off within 4-5 years so we are renting it out initially but have a lovely young couple moving in tomorrow. Thanks again, I love your work and love to see what new projects you are working on, lots of inspiration for me to finish working on my cottage. Lee, I would love to hear if you can find that paper in Auckland. I have admired it since Mel first posted this room. It is a mix of my favourite things: chinoiserie and blue and white. I have a blue and white theme in my bathroom, powder room snd laundry and I’d love to use it in there somewhere. Mel, who manufactures this? http://www.designerscollection.co.nz/ are stockists of Shumacher in Auckland, although I have not contacted them to see if that design is in stock. Mel may be able to get it for you if you can’t get it through this source. 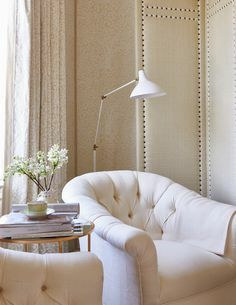 I have since seen a few similar styles at Thibaut but OISEAUX ET FLEURS which is the name of the design Mel used, is my pick but I have to convince my husband as he has a wallpaper phobia :(. Thank you for sharing great tips and I love that your approach includes budget conscious additions and some DIY because you can’t always buy what you visualise. With the wainscoat what material is being used? Thank you for your kind comments, glad the posts are helpful. It’s just an MDF profile. Very simple to put on. What a beautiful bathroom transformation you have done. You are one clever lady!. Just wondering where you purchased the little bathroom valley from. I am in Sydney and looking for a inexpensive pedestal vanity like the one you have shown in your bathroom. Happy to drive anywhere to pick up. Most of the sinks I have found onto have the nice detail and are more contemporary looking.I hoe you can share. Looking forward to hearing from you soon. Vanity is for a little cottage we are trying to brig back to life and is in need of a nice little vanity to suit. The pedestal vanity in the powder room is from Early Settler and one I have used a few times. It’s inexpensive and always looks fabulous. Schots in Melbourne also do a similar one. Where did you get the wallpaper? I love it!